construction complying with recognized national water tank codes. 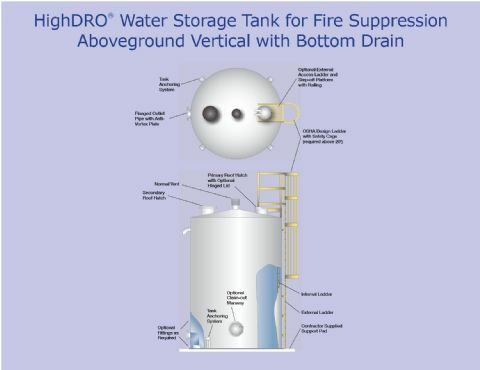 Fire protection tanks are hydropneumatic water storage tanks designed for use in fire protection systems. These ASME pressure vessels are required by fire codes in many commercial, industrial, and institutional buildings for use with automatic sprinkler systems for fire suppression. Fire protection vessels are designed, fabricated, tested, inspected, and installed in accordance with the National Fire Protection Association NFPA Standard No. 22, “Water Tanks for Private Fire Protection.” Building and fire codes may require a secondary on-site water supply for high-rise buildings. Compliance may result in a secondary water supply equal to the hydraulically calculated sprinkler and hose stream design demand with a required duration time up to 30 minutes. 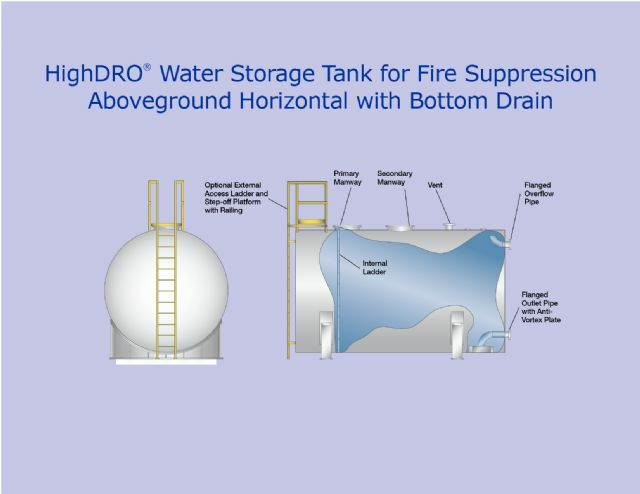 HighDRO® Wastewater storage tanks are required for use in wastewater systems where individuals or companies are responsible for disposal of their own domestic, commercial, industrial, or agricultural liquid wastes. 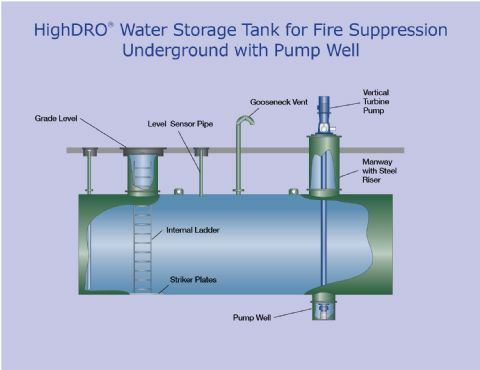 These “tight” tanks are available for either aboveground or underground installations and are designed to store a wide range of contaminated wastewater. Wastewater storage tanks are available in single-wall or double-wall construction and in a wide range of sizes, capacities. Carbon steel construction is standard with stainless steel available to withstand a wider range of temperatures, chemicals and pH factors encountered in industrial applications. High-solids epoxies, polyurethanes, rubber, PVC and other sheet linings, all dependent on the project and the liquid to be stored, are available for interior and exterior protection. 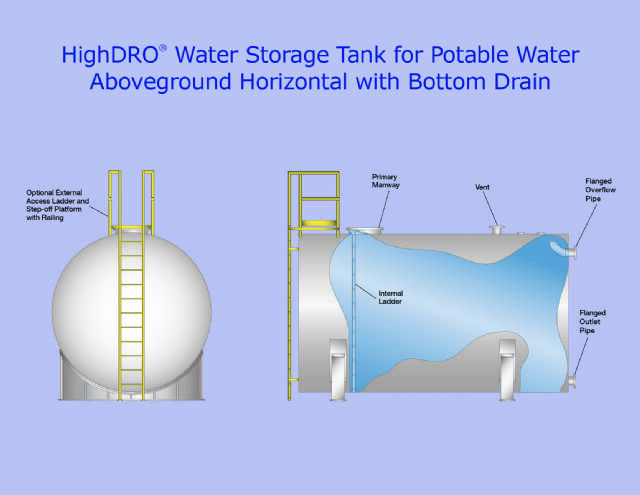 HighDRO® Rainwater collection tanks provide storage for harvested water from multiple catchment areas and provide safe and reliable water storage for reuse. 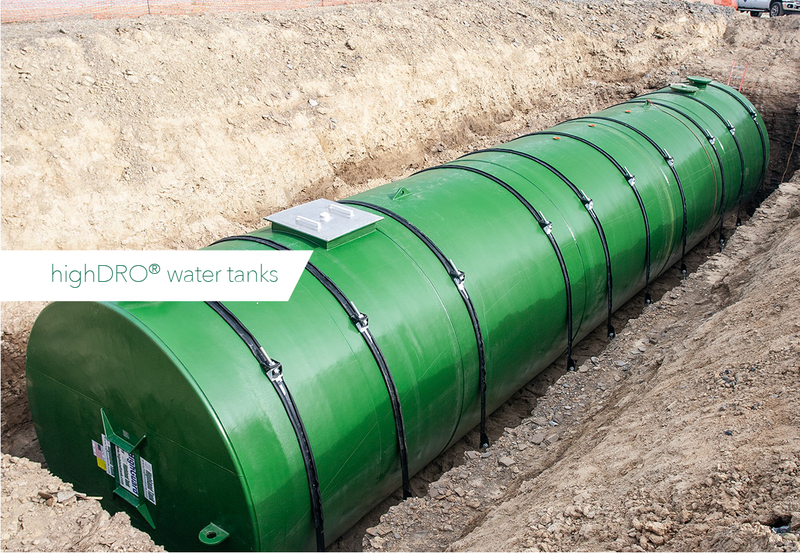 Rainwater collection tanks are available for underground or aboveground (horizontal or vertical) installations. Capacities range from 185 to 60,000 gallons. These factory-welded stainless steel or coated carbon steel tanks are designed to meet NSF and AWWA codes. They are fabricated with internal diffusion baffles, manways, ladder, submersible feed pumps with floating suction and all the necessary fittings for use with the system. 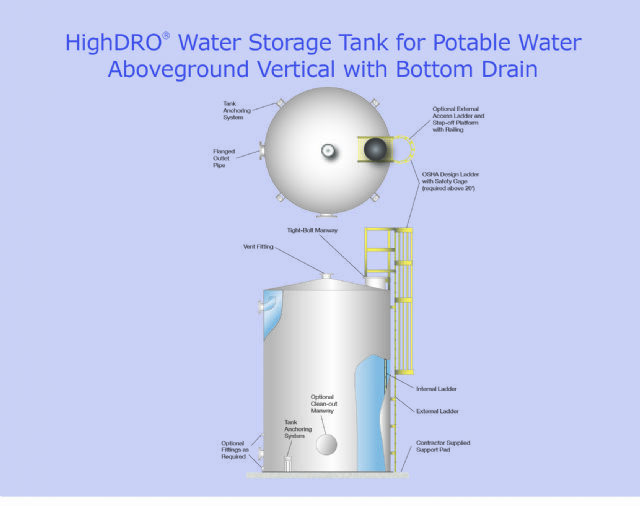 HighDRO® rainwater tanks are available for either aboveground or underground installations. 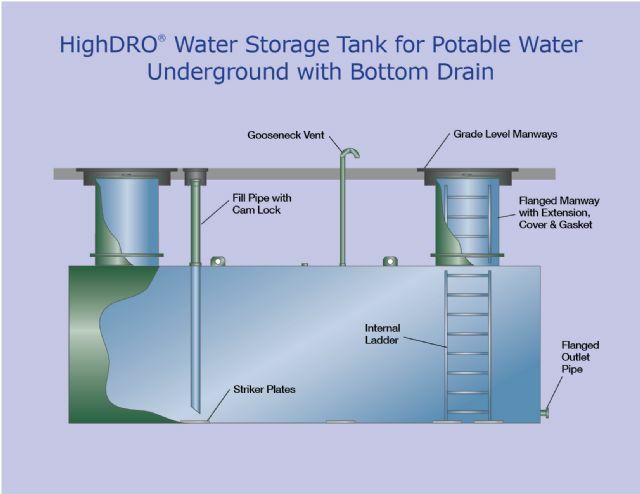 HighDRO® Rainwater collection tanks are a key element to earning valuable LEED credits in a “green” building. 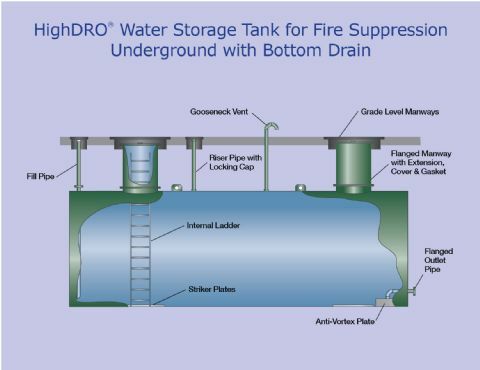 HighDRO® Stormwater retention/detention tanks have been widely accepted as an effective means of stormwater management to reduce the developed peak flow and provide a means of flow reduction and treatment prior to discharge from a developed site. Whether used to store and slowly release stormwater to the sewer system (detention) or dispose of stormwater onsite (retention) through infiltration to soils below or recycling onsite, these tanks help provide additional capacity to an existing sewer system, thereby improving its performance. Highland Tank’s stormwater tanks are constructed of high-strength carbon or stainless steel and protected with your choice of high-solids polyurethane, epoxy and other tough internal linings and external coatings. Cylindrical SDRTs are available for aboveground and underground installation. Our new, large volume rectangular tanks can be installed within the building or located in an exterior subterranean vault. They are lighter than concrete tanks, and unlike pour-in-place concrete tanks, they don’t crack and can be installed in any weather, at any time of the year. 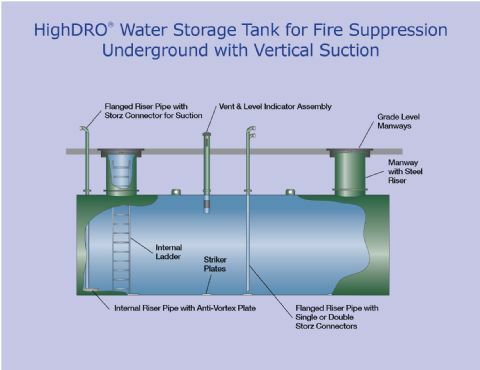 HighDRO® Decontamination Wastewater Storage Tanks are required at medical facilities to hold or store wastewater generated as a result of decontamination activities performed to remove chemical, biological, radiological, and nuclear (CBRN) residue or hazardous materials (HazMat) from equipment or personnel. 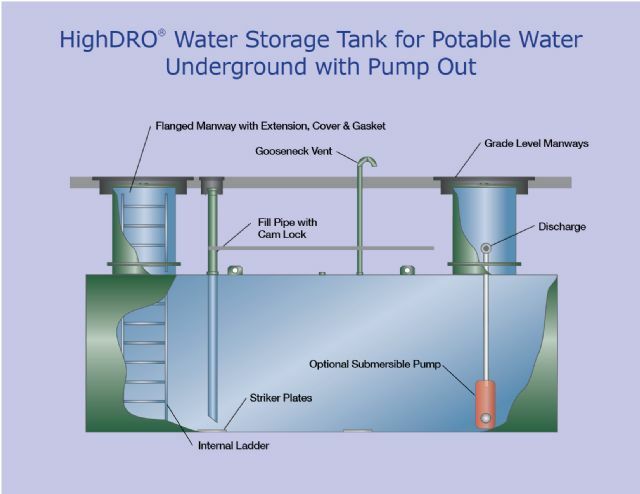 These “tight” tanks are available for either underground or aboveground installations and are designed to store a wide range of contaminated wastewater.